The company LANA GROSSA was founded in 1972 and has established itself as the leading supplier of top quality, high fashion hand knitting yarns. 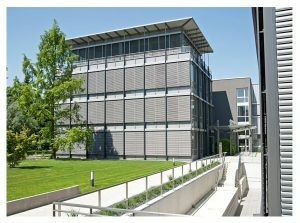 From its main distribution centre in Gaimers heim the company offers a range of products exclusively manufactured in Italy’s leading spinning mills, bringing together Italian flair and creative designs which meet the demands of the fashion knitting market. LANA GROSSA is the market leader in Europe with 1200 clients in the specialist trade. Our products have been well established for many years in Germany, Austria, Switzerland, the Netherlands, Belgium, Denmark and Luxembourg. Our broad product range is backed up by an extensive marketing support and a highly professional distribution system. The core program of our company is divided into four sub-groups and thus covers the main segment of a qualified retail business. 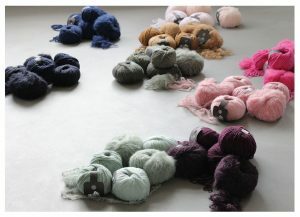 Our standard range offers classic yarns in Merino and wool with proven top quality. Standard yarns at LANA GROSSA have long-term continuity in our product range and are avail-able in a wide variety of colours which are constantly updated to reflect seasonal trends. Sock yarn “Meilenweit” by LANA GROSSA offers a huge selection of self-patterning yarns and plays an important role in our product portfolio. The group of fashionable classics is composed of current trend yarns, which are continued in the collection due to high demand over several seasons. Each collection by LANA GROSSA captivates with a wide range of fashionable novelty yarns. These determine future fashion trends in the hand knitting sector – both in terms of materials as well as colour spectrum. Knitting, crocheting and felting: These crafts offer something for every personal taste and skill level. Are you looking for relaxation or a rewarding end product? 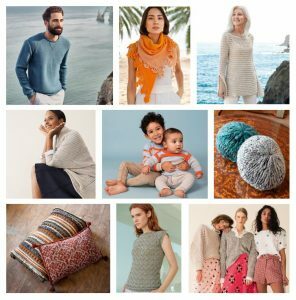 Does your personal style lean towards sock knitting, working with sustainable fibers, knitting for grandkids, creating beautiful home décor items or crocheting pretty shawls? We have good news! No matter what your personal preferences are, we have a yarn to suit every style and taste and every budget and we offer patterns for every skill level. Supporting our product range by beautiful and wearable patterns is very important to us. When you are looking for high-quality yarns that are well supported by fashionable pattern collections, our magazines and booklets are sure to inspire. You may choose from small pattern booklets and pocket-size magazines which showcase individual new yarns and current fashion themes. Designs in these booklets may highlight a specific yarn or an individual craft, such as knitting, crocheting or felting. 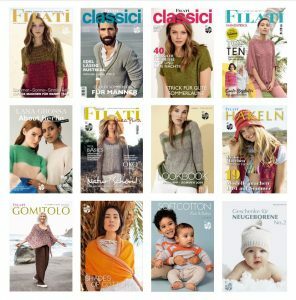 Or you might prefer our large-format FILATI magazine titles such as FILATI Journal, Classici, Infanti, Home and Hand Knitting. These stylish publications feature designs and yarns for every season and occasion. Quintessential fashion trends are summarized every season in our booklet COLLEZIONE. These booklets provide a first look at the most important fashion themes of the current season. Presents the best of the best in knitwear design. Visionary couture knitting and exclusive capsule collections created by experts in the fashion field. Moving away from the mainstream and combining urban casualness with creative chic is the successful concept of the “About Berlin” – previous Design Special. 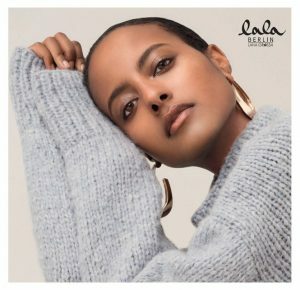 Like the extravagant, multi-design capsule collections which Leyla Piedayesh designs exclusively for LANA GROSSA under her fashion label “lala Berlin”. A collaboration, by now almost a tradition, which in addition to jointly developed, innovative yarns creates wearable avante-garde designs that inspire many knitting enthusiasts. LANA GROSSA is an active member of Initiative Handarbeit. To find out more about our involvement and support, please visit www.initiative-handarbeit.de. Be sure to also check out their helpful knitting glossary. Our common goal is to share our passion for handicrafts with as wide an audience as possible. Whether you’re looking for trendy do-it-yourself projects, new ideas to try or tips for beginners, Initiative Handarbeit is a great way to explore and discover knitting, crocheting, felting and so much more.